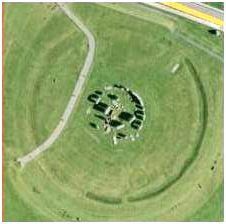 Perhaps the 360° Stonehenge dial in conjunction with the Hunebedden in the Netherlands are meant to point out a specific location like a Planet, Star, Star cluster, as well as a specific date. Stonehenge, the Hunebedden, the Great Pyramid and other such structures on Earth are connected, and π is an important factor in all of them. The current Earth axial tilt of 23.5° minus 16.5° shows that perhaps in the distant past the axial tilt was only 7°. The 26.565° between the yellow base and red line is identical to the passageways inside the Great Pyramid. 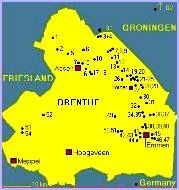 The N.E corner of the Netherlands has 54 Hunebedden sites mostly in the Province of Drenthe, Netherlands. This is one of 54 Hunebedden, and they are located in a small geographical area. This angle is identical in Stonehenge & Hunnebedden, Great Pyramid, and primes sieve info. 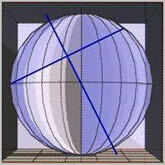 As mentioned in the Planet Diameters page this model shows perfect design and precision. A Solar eclipse viewed from Earth when the Moon covers the Sun briefly, increases our awareness of perfect distance, place and time. The thought that comes to mind is the parallel between God symbolized as the Sun and satan as the Moon, where satan as the lesser light stands in the way of God, but not for long. 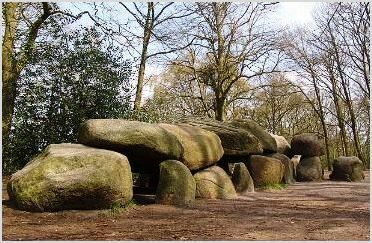 Those very large stone formations named Hunebedden in Dutch are sometimes translated as graves of the Giants. Some have theorized that these structures were built by the giants who once walked the earth as the Bible claims. Even so, levitating technology was used even thousands of years ago. The Sons of God in Gen 6:2 simply means Angels. Good or bad they are still sons of God, seducing and impregnating flesh women with their offspring (the giants), being abominable hybrids between Angels and flesh women they were the giants of (Gen 6:1-6). This was the reason God brought about Noah's flood as the Bible clearly states to destroy them. There was another irruption after that and Goliath was one of them. The heroes of Greek mythology have a basis of truth! However, the Architect of the Great Pyramid is God, not Egyptians! The G.P is mentioned in Isaiah 19:19-20. And the sum total of the numerical value of the Hebrew text of Isaiah 19:19-20 is also the Great Pyramid's height in Pyramid inches from ground level to the capstone platform. As stated earlier, Stonehenge and the Hunebedden appear to have a connection to the Great Pyramid. A flood may have prevented information sharing through language but saved by these large stone formations. It is likely that the immense stone structures the world over containing important knowledge are for our benefit, waiting for the right time when we are ready to understand and decipher their messages and forewarnings. 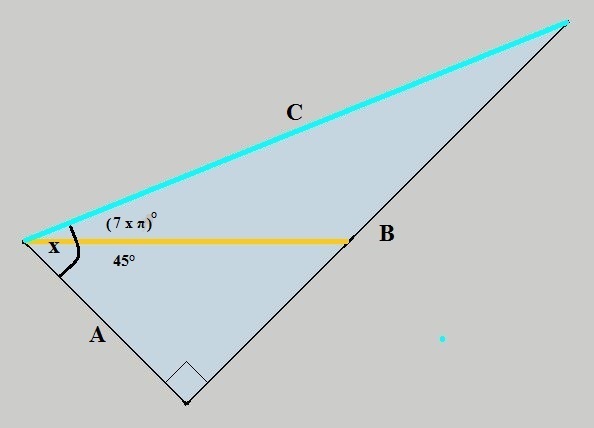 This 3125 by 1250 rectangle produced a key number 3.1399074... at the junction of the blue line (B) and red dotted infinity line (A), which resulted in another important number 3.1416026..., next to pi. The small triangle enlarged. It is interesting how the blue circle sections at 88.75° meet the black 90° straight-line sections perfectly on both ends (90 - 88.75= 1.25). Perhaps of interest to someone interested in light refractions. Imagine this phenomena as layers of lenses condensing light or gravity towards the center. The physical limit 3.2 was explained in the square and circle page. 3.144654088... as found in the Square and Circle page, and 3.139907440... as explained in this page. One precessional cycle at the current rate takes 25920 years to complete, minus 25200 = 720 years! (3.)144.654088050314465... x 14 = 2025.157... Year? (3.)141.6026716845513... x 14 = 1982.437... The time of the "setting up" of the beast system. Also Daniels days. The year 1948.5 is very interesting as well. It is the date that Israel was re-established! In Fermat's Last Theorem page, I described a blending of visible and invisible realities and the significance of the numbers 330 and 331, and where 331 makes for a complete unit. 331 / 8 = 41.375 x 49 = 2027.375 - = (331 x 6.125 = 2027.375) If years, then May 2027 (using a 30 day month). This next example shows the ominous numbers associated with the now famous date of the September 2001 twin tower bombing. It triggered the justification to force the world’s population into the New World Order membership I.D scheme based on biometrics, using National I.D cards or whatever, and like convicts in jail we are now under constant surveillance. The NWO creators have as their objective to bring all souls of this world under a one-system rule, and ultimate government control. 2001.8 / 14= 142.985...x 7.777...= 1112.111...x 4= 4448.44... and this number is just as surprising as the 1948.5 case, because √4448.44...= 66.6966696669..., so 4448.44... / 4= 1112.11...x 1.8= 2001.8 or September 2001. These next number results came from here.